I'm not sure where the money came from, but California State Parks has launched a new website, Find Recreation, to assist hikers and campers searching for California trails, parks, and/or campgrounds. My favorite feature is the satellite view. Wondering what the Bullfrog Campground at Austin Creek State Recreation Area looks like? Click the campground option on the Google map, then navigate to the park, zoom in, and there it is. With the s atellite view, you can easily see if a campground is shaded, exposed, close to a busy road, even sometimes, how far apart the sites are. If you zoom down "into" a park, a window pops up with management agency information; click though to go to the parks website for more info. There's also a driving/transit directions feature. 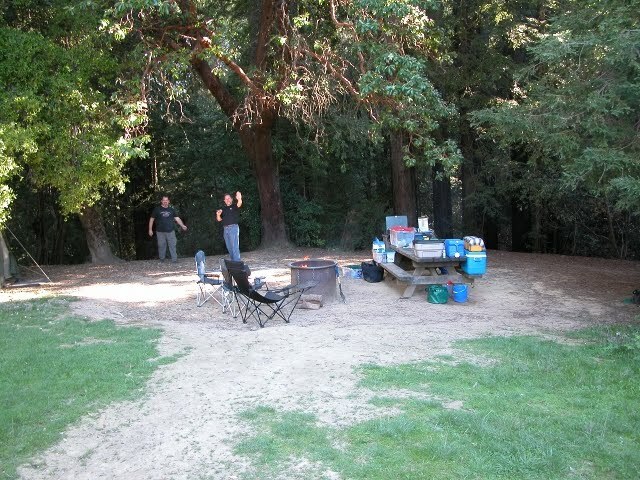 This is a California State Parks website but information is also displayed for campgrounds, parks, and trails outside of the state park system. You can compare campgrounds managed by the National Park Service, California State Parks, as well as regional park districts and public utilities. This feature is so great for camping trip planning: make a list of campgrounds that sound promising, then in just minutes you can explore all throughout the state. Some kinks: if you zoom in as far as the system allows, the satellite resolution is sometimes quite blurry, I couldn't get the 3D Earth View to work at all, and as far as I can figure you can't search for specific destinations within the Find Recreation site (the search box pops you out to the main CSP site; the search feature only allows you to search for campgrounds, trails, and parks within x miles), but I'm still thrilled with this site. One big thing missing: campground reservation info! Once you locate a campground, it would be great to link to the reservation site, rather than navigating through the management agency. I hope that CSP will add that in the future. What is the dif between the reservation site and the managment agency? Anon, sometimes the campground is managed by the state (or county, or federal), but is managed by a private agency. And Reserve America is a separate website -- I'm saying it would be easier for users if you could click directly from the state website to the reservation site. It was a challenge to scrape together funds for this site. This project is a great example of different organizations working together to leverage their very limited funds. California State Parks, GreenInfo Network, the Resources Legacy Fund, Sierra Nevada Conservancy, and a half a dozen others all pooled their resources to complete the California Protected Areas Database, the search engine that runs FindRecreation. For more information on CPAD, and how it was funded/created, visit www.calands.org. p.s. Great suggestion on incorporating reservation systems into the FindRecreation site! We are working on including those types of enhancements.